Russia’s relationship with Sudan is far from new. Moscow has been exporting substantial amounts of military equipment to the country for decades, even after a U.N. arms embargo was put in place in 2005. Sudan holds the distinction of being the first Arab nation to purchase Russia’s Su-35 jet. What has changed recently, though, is the depth of Russia’s engagement, which now encompasses substantial economic interests and underscores Moscow’s reliance on Sudan as a springboard for its broader strategic goals in Africa: access to the Red Sea and natural resources, and the general expansion of its regional influence. Red Sea access has become a matter of some concern for Russia as it attempts to compete with the U.S. and China’s bases in Djibouti. After Djibouti denied a Russian request for basing rights, Sudan and Eritrea were the only viable alternatives in the region. Russian and Sudanese officials have both indicated that a base is in the works, as well as agreements allowing naval vessels to dock at each other’s ports. Meanwhile, securing natural resources, particularly fossil fuels and minerals, constitutes a growing share of Russian activity in Sudan. Despite the loss of 75 percent of its proven oil reserves after South Sudan attained independence in 2011, Sudan retains the infrastructure to bring South Sudan’s oil to market. Recent agreements between the two will likely facilitate a greater flow of oil through Sudan. In addition to oil exploration deals with South Sudan, Russia is currently working to establish a refinery in Sudan to process oil before it is exported. The discovery of large gold reserves in 2015 by a Russian company has also fueled economic interest in Sudan. In a 2017 meeting with Russian President Vladimir Putin in Sochi, Bashir granted a Kremlin-linked company permission to start mining operations. Beyond economic opportunities, deeper engagement with Sudan makes it easier for Russia to pursue its other interests in the region. Following Bashir’s meeting with Putin in November 2017, the number of Russian citizens entering Sudan on a quarterly basis reached an all-time high. Part of the influx stemmed from the arrival of Russian mercenaries working for the Kremlin-linked Wagner group, who were sent to protect Russia’s installations and train local security forces. In December 2017, leaked footage showed Russian trainers working with the Sudanese army. Russia cannot afford to sacrifice the economic and diplomatic benefits of having Bashir in its orbit. By setting up shop in Sudan, Wagner and other Russian mercenaries have better access to Moscow’s installations and resource concessions in the Central African Republic and South Sudan. Russian mercenaries have reportedly entered the Central African Republic through Sudan multiple times to meet with rebel leaders, both to encourage their participation in the Russian-sponsored peace process and to negotiate resource concessions. As Russia’s engagement with South Sudan continues to expand, Russian private military contractors, or PMCs, based in Sudan will be well-positioned to enter the country to guard Russian interests and train the country’s security forces. Russia’s growing engagement with Sudan is increasingly being discussed against the backdrop of heightened discontent among the Sudanese population. Sudan’s economy is struggling under the weight of rising fuel prices, inflation and widespread corruption. After the government tripled the price of bread in December, Sudanese opposition parties began to protest, calling first for better management of the economy and then for the resignation of Bashir, who has been in power for 30 years. Sudanese authorities declared a state of emergency and have suppressed demonstrations through the use of tear gas, batons and live ammunition. The government says over 30 people have died in the clashes, but opposition groups say the number is far higher. Many of Sudan’s partners have had little to say in defense of the regime in Khartoum, but Russia has remained a stalwart ally. 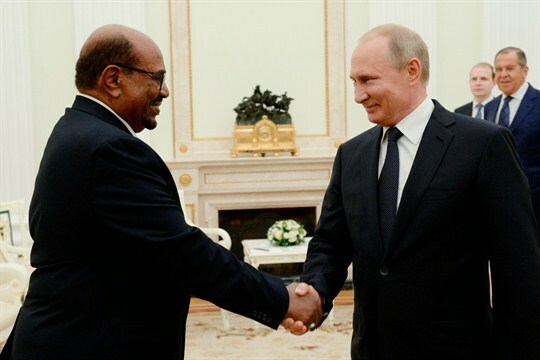 Throughout the crisis, Putin and other senior Russian officials have continued to take high-profile meetings with their Sudanese counterparts, even going so far as to personally invite Bashir to the first Russia-Africa Summit planned for October. Russia has also provided some support on the ground. Sudanese opposition members and independent analysts have claimed that Russian mercenaries from Wagner have been present at demonstrations and are training the Sudanese security forces to suppress the opposition. An official spokesperson of the Russian government confirmed the presence of Russian PMCs in Sudan, but denied allegations that they were working on behalf of the Russian government. While Russia and Sudan are unlikely to deploy mercenaries against protesters outright, Wagner and other groups have demonstrated a willingness to train and equip the Sudanese military to suppress the protesters if need be. As crises in Venezuela, Yemen and South Sudan overshadow Sudan’s protests, the Bashir regime may be able to leverage its relationship with Moscow to weather the current domestic turmoil. Russia’s continued support already seems to have paid dividends for the embattled regime, shoring up the confidence of Sudan’s other partners that Bashir can withstand the protests. Sudan secured loans in excess of $300 million in mid-March from the UAE-based Arab Monetary Fund and Arab Trade Financing Program. Qatar released a statement of support for the Sudanese regime in late January following a visit by Bashir. As long as Sudan remains useful to Russian interests, Moscow will continue to support Bashir or a hand-picked successor. In the short term, Russia cannot afford to sacrifice the economic and diplomatic benefits of having Bashir in its orbit. From the Russians’ perspective, Bashir is a loyal partner who allows them to strengthen their influence in sub-Saharan Africa while competing with China and the U.S. for geographic access and resources. *Marcel Plichta is a postgraduate student in global security at the School of Social and Political Sciences at the University of Glasgow. He has previously written on the Central African Republic for Defense One, Small Wars Journal and International Policy Digest.